← WTF Wednesday: Why Did Kate Hijack My Life? This entry was posted in Uncategorized and tagged 2016 Election, Business, Celebrity, Culture, Politics, Social Media, Stupidity. Bookmark the permalink. Hilarious analogy. Loved this post and sorry I missed it last week. “Numpty” was my personal favorite. That is such a great analogy. My mother used to warn me not to “cut off my nose to spite my face.” I’m thinking more than a few Brits are now wondering what happen to their noses. Now that was the perfect analogy for brexit. Did you watch the John Oliver segment that he did just before the vote? It was brilliant. Of course, now, you have to come up with something brilliant for tomorrow WTFW since you’ve used brexit today. Your fans (meaning me and your mom) are looking forward to it. Wow – I’ve always been proud that I could swear like a pirate. 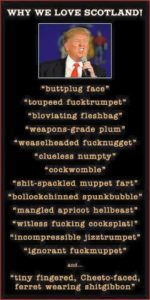 Now I aspire to swearing like a Scot. I just need to learn how to pronounce all those words. And I need a cheat sheet to remember them. I’m partial to weaselheaded fucknugget because it’s so versatile. Appropriate for so many scenarios. Wow! Some of those (most of those) I’ve never heard of. If this what happened with the tea party here? Everyone wants change but most don’t understand all the implications. They only want the ones that are favorable to them. Me, I’d like the cost of Starbucks go down just a little. Haven’t figured that one out yet. So, your Mom moved without a forwarding address? There’s a message there…..
People always either do or do not want change; frequently simultaneously. Change for the sake of change is not a good thing. But of course what concerns me most is the effect on the price of your mocha latte. That is paramount.